The Ideal City was a concept that inspired many Renaissance artists and architects, among them Luciano Laurano, whose painting by the same name in Urbino was the starting point for this study in Renaissance clarity and sense of perspective. 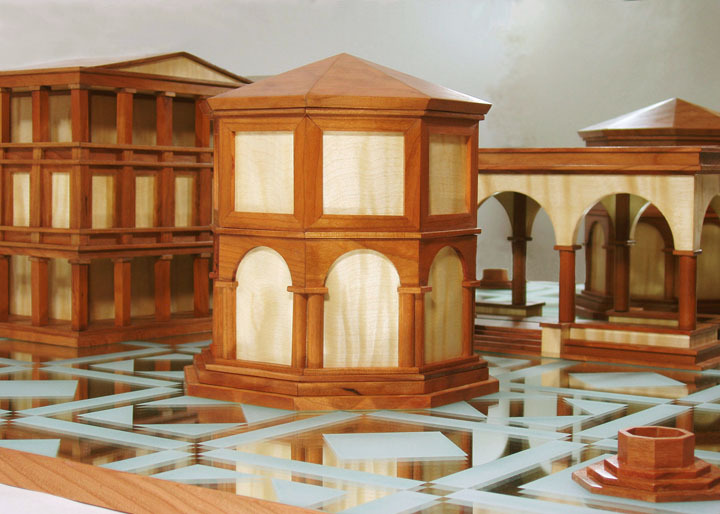 This sculpture box is inspired by that painting and is an ensemble of four buildings and two wells of cherry and English maple set on a plaza of etched mirror against a plain mirror backdrop. The roof of the temple lifts off, and the inside container is finished with columns and arches. Both the left and right buildings have roofs that lift off to reveal a compartment on the top storey There is a drawer that pulls out on the second storey of each building, and on the first storey is a secret compartment accessed by lifting a false floor on the second storey. The sculpture has a total of eight compartments. The overall dimensions are 11"h - 35"w - 23"d.